I’m sure there are quite a few people out there who think pesto needs parmesan cheese, and I suppose I used to be one of them. But you know what? It ain’t so! Yes, back before my dairy-free days, even my own pesto recipes had a heavy hand with the cheese. And I’ll admit, it took me awhile to land on a cheese-free pesto recipe that I liked just as well. But then, it happened! Hallelujah and praise to the pesto lords. 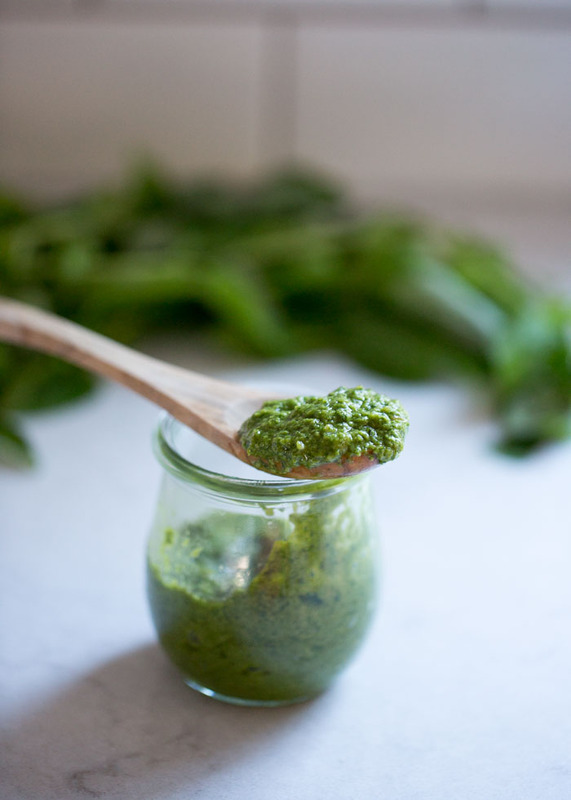 I absolutely adore this vegan basil recipe and I have a sneaking suspicion you just might too. 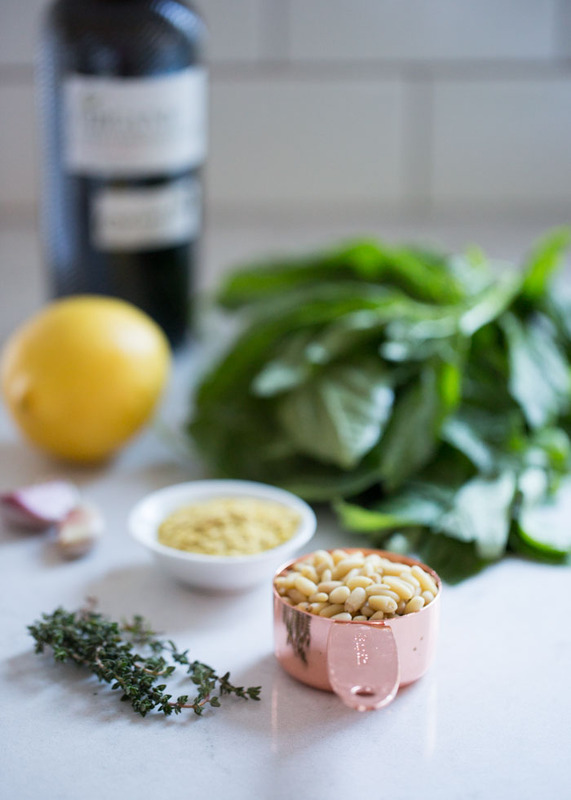 We’ve got some nice, traditional ingredients going on – basil, pine nuts, good olive oil, garlic. And then a few extras: lemon juice for zip, nutritional yeast for that nutty umami effect that parmesan used to bring to the table, and some fresh thyme just because it’s oh-so good. The thyme is optional, but I gotta enthusiastically recommend it. The addition is inspired by the one and only Isa and it’s so good in there. Because it’s still plenty tasty straight out of the blender, and it’s super easy to make that way too. 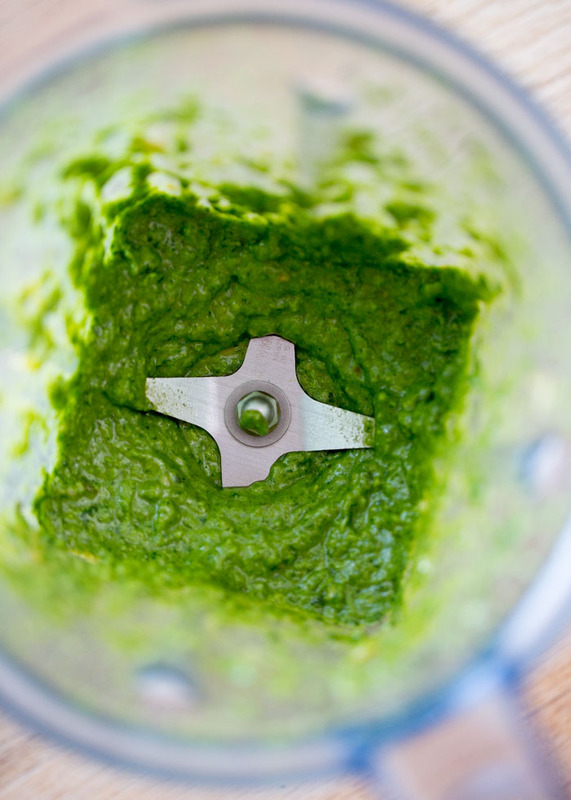 Seriously, just seeing that picture of freshly blended bright green basil pesto just makes my heart go all a-flutter. Make some for now, make some for later (just freeze it in ice cube trays and pop out a cube whenever you need a hit of flavor). Either way, just make it! 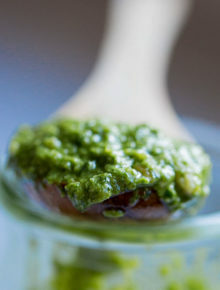 Oh, and some ideas for enjoying your vegan pesto? I, Ms. Pesto Obsessed, have a few of those! How about as a base on some pizza along with a thin layer of heirloom tomatoes and some cashew parmesan sprinkled on top before baking? Vegan pizza nirvana. Or tossed with just-out-of-the-oven roasted baby potatoes? Drizzled on top of your favorite minestrone? Slathered on a grilled vegetable sandwich? Stirred into some pasta and topped with cherry tomatoes? 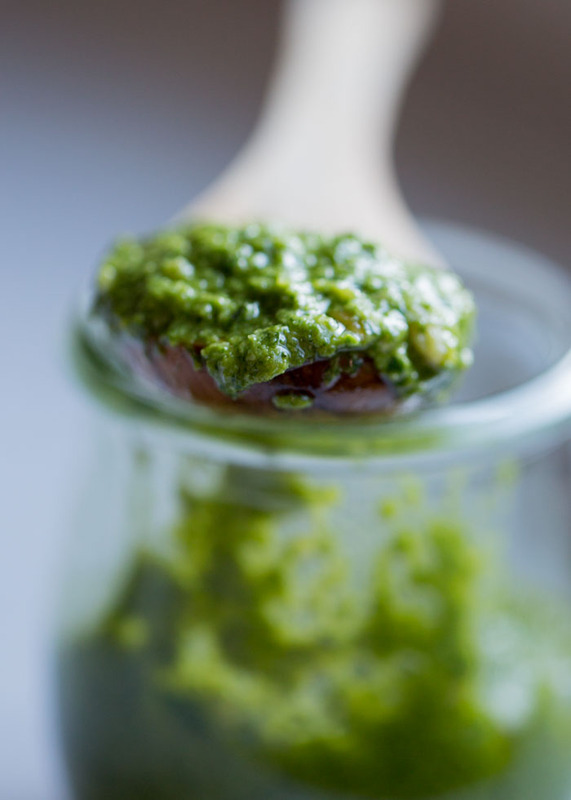 Pesto, baby. Is there anything it can’t do? Place basil, pine nuts, nutritional yeast, garlic, lemon juice, thyme (if using), salt, and 1/2 cup olive oil in your high-speed blender (I use and recommend a Vitamix). Blend until a bit of a paste forms, drizzling in more olive oil as necessary until your pesto reaches the consistency you like. Taste and add additional salt if desired. Store in an airtight container in the refrigerator for up to 5 days or freeze for up to several months. 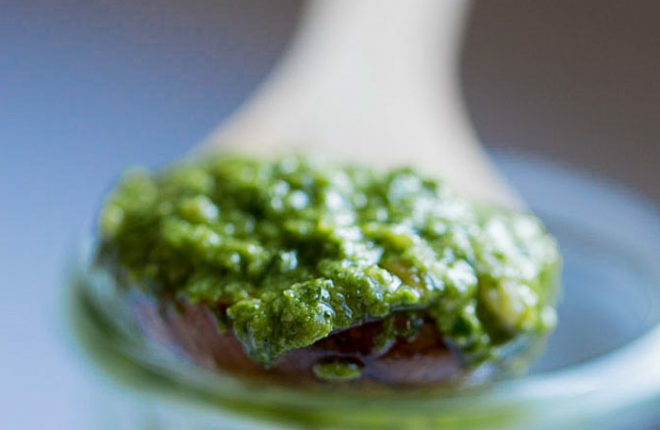 This recipe makes a nice big batch of pesto. I often cut this recipe in half. It’s doable but sometimes it’s just not quite enough quantity for the blender to operate efficiently. So just keep that in mind if you want to half the recipe – you may be doing some extra scraping-down in order to keep everything moving and blending evenly.